Meet Ringo, my mischievous miniature, nearly 4 and still acts like a Pup. 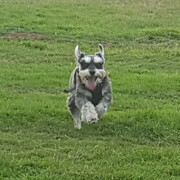 Hi Julie, welcome to the forum and I love Ringo, he has a great schnauzer gallop. Welcome Julie and Ringo - good work on getting an action shot.